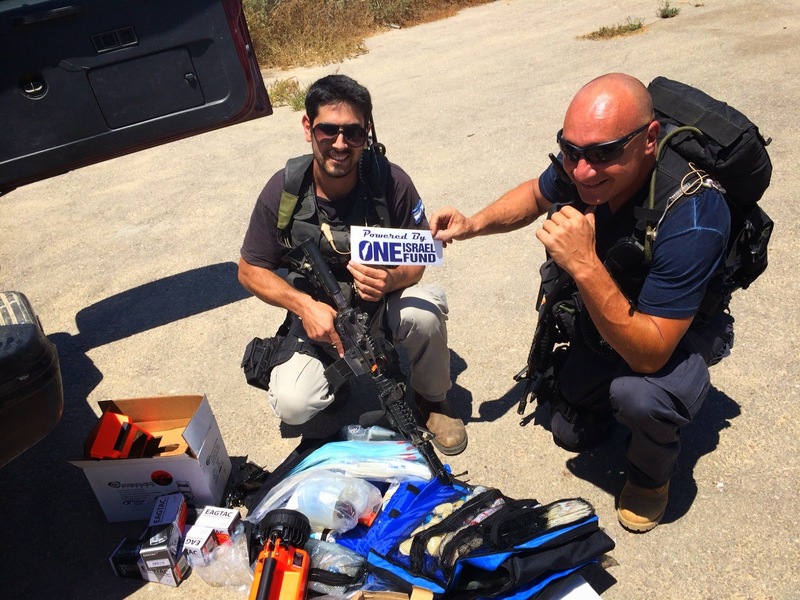 Yesterday, the first day of "Operation Protective Edge", I accompanied Marc Provisor down to the Gaza border to bring some much-needed medical/security gear to kibbutzim that are in the line of murderous rocket fire by Hamas and other Islamic "militants". These kibbutzim have, in some ways, fallen through the holes in the system: while their security teams co-ordinate all operations with the IDF, the IDF has "bigger fish to fry", and these teams often go without crucial equipment, from medical supplies to security gear, to simple things such as batteries and flashlights. Marc, and the One Israel Fund, is trying to fill this gap. From what i saw yesterday, he's doing a heck of a job. Marc is my friend and neighbor. He lives two doors down from me in Shilo, a Jewish community in the Shomron (Samaria). Here, too, we know what it is like to "fall through the cracks" of large, cumbersome systems and bureaucracies in times of emergency. Marc moves fast and takes initiative, which is something desperately needed in these times. Two nights ago he posted a comment on Facebook that said "Anyone interested in helping me with an equipment run, send me a private message." I responded right away. I had some free time, I'd always wanted to accompany him on one of these trips, and anything was better than sitting at home reading the increasingly horrifying news of intensifying rocket fire from Gaza, and our response to it. I got a first class ticket. Yesterday morning we threw some flak jackets and helmets into his jeep and headed out. First stop was a small community outside the city of Ariel, where a jovial man named Ze'ev runs an operation that imports, collects and designs/packages medical equipment. Here i saw firsthand that Marc doesn't just collect donations and get this stuff to where it's needed. He is deeply involved with the actual design of the various forms of medical kits that One Israel Fund distributes. He was doing it right there in front of me, while Ze'ev was packing them. Making suggestions, throwing out ideas like confetti, bouncing them off Ze'ev as we put the gear together. This gear, while always in a state of development, is already fully functional, streamlined, and ready to go. All the ideas and suggestions were for next time. We packed the gear in the jeep and drove to Kibbutz Einat, just over the "green line" from Ariel, where we met up with Eiran (not "Iran", he explained to me, laughing) and packed the jeep with more gear. Tactical flashlights, vehicle-mounted floodlights, various forms of emergency lighting. A lot of light. We wanted to bring "light" to the embattled south of the country,, and Eiran was our man. We headed straight south from there, the jeep full of goodies. The road to the Gaza border was as one might have expected: a lot of cars heading north, more and more the farther south we got. On our side of the road, by the time we got close to where we were headed, there were almost no cars going south, towards the dangerous areas where we were headed. We had the "pleasure" of stopping along with some of the other drivers on that road to head for a roadside bomb shelter when one of the frequent "color red" warnings was sounded. You have 15 seconds to stop the car and hit the shelter. People were taking it seriously but, as they say, "morale was high". The Jewish equivalent of "high fives" were exchanged after we heard the distant booms of Israeli returning fire, and we were on our way again. At Re'im we met up with Guy, the regional coordinator between the IDF and the local security teams. He would be our guide for the rest of the trip. What can i tell you about Guy? He was a mensch, under a lot of pressure. He didn't know us from Adam. He just wanted to help, and that meant helping us help. He was doing his job. I could say all this and more about everyone we met yesterday. Guy took us first to Kissufim, where we were met by the Rav Shatz (the local security honcho, hereafter referred to as "R"S") and, I guess, his deputy. They were both completely tricked out in military gear that would make readers of "Soldier of Fortune" drool. I've lived in the Shomron for twenty years, through all sorts of hellish military situations, (albeit as a civilian) and I’d never seen anything like it. Even Marc was a bit taken aback. "Probably just trying to impress us", he whispered to me. As it turned out, that may have been true. But they were friendly, sincere, and clearly grateful that someone from "the outside" had come to show some solidarity with them. And yes, they were clearly quite competent. They weren't playing around. The younger of the two was the actual R"S. He was in his twenties, named Sa'ar. He looked like a movie star. In more peaceful times, i would guess he was quite the "lady killer" around those parts. He was talkative, kind of puppy-like, even. It was hard not to like him. He had been born and raised down there, he told me proudly (as did everyone we met from this point on. He wanted to know who we were, where we were from, what we were doing exactly, what the mood was like in the rest of the country, in particular in the "settlements". I'm a conversationalist, so i kept him busy, with pleasure, while Marc attended to the business of distributing the gear we'd brought. We were taken to see a couple of recent rocket strikes, one on a chicken coop. While we were there we had to take cover from just such a strike. We heard (and felt) the boom, very close, and responding fire from the IDF. In those seconds, everyone locks into "professional" mode. As security guys, our new friends ordered me to shelter by a nearby cement wall, and as a civilian, i obeyed. There was no fear, just.... this is how it is down here right now, my friends. It was us, the soft-spoken fellow who owned the chicken coop, a curious bystander, Guy, the security guys, the IDF, and, a mile away, a huge, insane terrorist organization with thousands of fighters and missiles who were trying to kill us. That's just what it was. There was nothing to talk about. We said warm goodbye's, wishing them strength, and moved on. Next was Ein HaShlosha, even closer to the Gaza border. Here we were met by Rami, who was very different from the R"S of Kissufim. An older man in his sixties, he'd been around the block a few times. He was wearing just a t-shirt with an Israeli patch sewed onto one arm. He carried only his sidearm, though his M-16 was in the front of his pickup truck, pointed right at me when i settled into the shotgun seat. I re-arranged it gently. I was sitting in the front because Marc and Guy wanted me to get a good look at what we were going to see. They were old hands, they had already seen it. I am grateful to them. Rami gave us quite the tour of the kibbutz and the border. Recent rocket attack sites, one of them as yet unexploded, near which we got out of the truck and i took advantage of a shameless photo op. I later felt that my grin in the photo was inappropriately incongruous with what we were seeing and the general situation, but it was genuine. These men were not afraid. They were doing their jobs, and as anyone who's ever done an uncomfortable job knows, humor is key. There is generally no room for sad sacks. We were all joking around about this terrible situation. And that, in my opinion, is how it must be, in most cases. Here, at Ein HaShlosha, I was also introduced to the awful idea of the "terror tunnels" up close. These are not just the regular tunnels for bringing weapons and goods in an out of Gaza. They are built, over many months, for a single use: for terrorists to "pop up" inside the kibbutz and randomly kill as many Jewish civilians as possible. The terrorists who are doing this know that they will be killed if they succeed. They know that the months of labor will lead only to one short, deadly encounter, and that the tunnel will be immediately destroyed afterwards. I found the idea of the blind hatred necessary to do such a thing to be even more unsettling than the rockets. I listened to Rami with even more respect as he described how the IDF would inform him of the existence of the tunnels, detected by sophisticated sensors, but not much else, until they were blown up before reaching their destination by the IDF. The destruction of one of these tunnels lead to the deaths, a few days ago, of seven Hamas "operatives" who were inside it hard at work at the time. Rami described his frustration at being able to do little for his friends and neighbors about these sophisticated and potentially deadly terror attempts, but also his admiration for the IDF who, while not keeping him "in the loop" as much as he would like, still managed to protect the kibbutz from such infiltration attempts. So far, and with God's help, he said. We could do little but give him the gear for his security team and wish him a hearty farewell. Still it was something. At the time it felt like a lot, actually. We shall see. Next up: Kerem Shalom. We were greeted by the R"S, Ofer. Ofer had known of Marc and his work with One Israel Fund, and was the one who contacted him in the first place for help. Ofer was the reason we were there. He struck me as a good man in a tough situation, but about as close to the end of his rope as anyone I’d ever seen. His kibbutz had been among the hardest hit. He was, in fact, to be immediately (if temporarily) relieved as soon as we finished our visit there. Some kind souls had thrown down for a short "vacation" for him, they were sending him to a show in Tel Aviv. His teeth were on edge, his burden too large to bear. It was hard looking at him, frankly. He was very happy to see us, under the circumstances, and made us the best cup of Turkish coffee, Israeli Army-style, that I’ve had since...well, since the last time Marc made it for me. Ofer's office had a collection of Kassem rocket fragments, which i found fascinating. Marc explained a bit about the workings of the big bastards while Ofer made the coffee. It was like a little museum of psychosis, there in Ofer's office. This is what happens when hatred meets steadfastness. It's not a comfortable place to be but yet again, i was moved and humbled by the sheer competence and self-sacrifice of those i proudly call "my people". So: more gear distributed, more blessings exchanged, Ofer is off to a much deserved shower and a show in the big city, and we are off to Nirim. All the towns we've visited up to now are pretty much right on the Gaza border, and Nirim is no exception. Maybe even a bit closer. There is sadness here. The whole population was evacuated hours before we'd arrived. There was no one there except the R"S, Zevik, a few random stragglers, and a couple of Thai agricultural "foreign workers" who had apparently missed the evacuation and were waiting for another ride to take them to a safer part of the country. Zevik's eyes were red from lack of sleep and stress. He was maybe in his fifties, t-shirt with Israeli flag patch, sidearm, big belly, easy laugh. But tired, very tired. He showed us around. Here, a rocket hit in the middle of a small park. Here, one exploded in a tree, showering a nearby house with shrapnel. I was struck by all the children's toys in the yard- bicycles, dolls, a miniature punching bag. I thought at first it might be a kindergarten. The occupants were "on vacation" along with everyone else. It felt like a ghost town. We stayed a bit longer with Zevik, schmoozing while we unloaded the gear. He was clearly very happy to get it, and even happier for the company. A lonely hero of Israel, guarding his turf, his neighbors more safely quartered elsewhere for the time being. Again, warm goodbyes and blessings, and we were headed back up north. We stopped in Sderot for a felafel. The town felt, to me, determined. Skeleton crew. A few people stared at us curiously. Supposedly there are a lot of journalists based in Sderot right now, but they must have been somewhere else when we were there. When we hit the road again for the long ride back to Shiloh, we didn't talk much. There was a lot to think about, and we were getting regular reports about how "the situation" was escalating in a big way. Terror attack from the sea. Missiles over Tel Aviv and Jerusalem. Call-up of forty thousand reserve soldiers. More booms. We saw the smoke rising from the Gaza strip. I wondered about what kind of people could possibly live over there and support what Hamas was doing. I wondered about how some of my friends wonder about how i could wonder. Marc was worried about his son in the army. I wasn't a tourist, we have been friends for over 20 years. We didn't feel the need to amuse each other. We knew we'd wake up tomorrow, God willing, on the same street, two doors down. We knew we had seen wonders and miracles and helped, even if in a small way, to bring a small people with big hearts a little bit more together at a tough time. That's just how it was. It's how it is, right now. Many media outlets are carrying stories of how Israelis, both civilians and soldiers are calling for the revenge of the gruesome kidnapping and murder of three Jewish boys. If that wasn’t enough, they are now screaming at Israel for the yet unsolved murder of an Arab boy in Jerusalem. The Arabs constantly and consistently, with the major assistance of world media and the anti-Israel crew, harp about Jewish violent acts and vandalism directed against them. Never mind that Arab violence and vandalism against Jewish targets far out weighs and out numbers the before mentioned. The calls and shouts in Israel are for the most part not about revenge against “Arabs”, they are for calls to destroy terrorists and terrorism. Many of these signs posted are simply and purposely mistranslated… where the word “Mechabael” is used, meaning terrorist, most media outlets translate it into “Arab”. Now that in its own is interesting, how these progressive folk immediately translate and equate the word Terrorist to Arab, but that is an entirely different topic. What we are witnessing is not an outbreak of racism, but a cry to our government, to our Prime Minister, to give us what is our simple right of having our country defend us, no more, no less. Bibi and this government is failing, he has been failing as so many politicians do when it comes to standing up for our simple rights. Our Southern region gets pummeled by rockets and all he can do is threaten that he will get the Security Cabinet together to drink mineral water and discuss what should we do… over and over again, and some aerial attacks against Hamas targets that have had no effect. Abu Mazen and Hamas join forces continue the same incitement against Jews, the same that for the last 20 years has led to the majority of murderous acts against the Jewish people, and he says “I don’t want to see you. Jewish Farms in both the North and South are victimized by Arab marauders to the point where some have to close up shop and his Internal Security Minister along with the Chief of Police twiddle their thumbs. Jews traveling in Judea and Samaria are shot at, attacked by rocks and Molotov cocktails, ambushed, and yes at times killed, and he and his trusty Ministers do no more than hold meetings, while their General only employs the minimum needed procedures, barely accomplishing anything. Every time reserve soldiers are called up, ready to give the ultimate for our people, yet despite their motivation and dedication are then told that “not responding is strength”, and sit like dogs waiting for a scrap of leftovers. Every time you tell the Artillery teams to waste taxpayers money and bombard an empty field, and when you tell Security personnel, don’t fire until you have been hurt…. what do you think you are doing? You are accomplishing more than any terrorist ever hopes to achieve, you are hurting the souls of this people who have built this land and stand for far more goodness that any of our neighbors. Imagine a father watching his children hurt before his own eyes, not being allowed or able to save and protect them. If there is ever a reason for acts of violence being committed against Arabs, they come from the despair of not enough being done to maintain a civil existence. Vigilantism like in any society is for the most part the result of frustration. Indeed the Arab world laughs at us. They rocket us, Bibi says, you better watch out or I’m gonna…. and then he gives them a few days for an “ultimatum”, a which point they rocket us some more and then spin it like they are the good guys by stopping the attacks against us. Arabs take to the streets and destroy their own areas, endanger countless people and our police lack the ability to keep order. We saw a taste of real response for an unfortunate 18 days where due to innocent boys getting murdered, our children in the IDF went after the bad guys, and guess what, the Arabs knew that something might change. But they still stood their ground, because they knew that Israel’s leadership no longer places the security of our people to be paramount, that Israel’s leaders no longer trust themselves, or have confidence. They know that Israel’s leaders think that Israel’s security depends on having people on the outside say what a nice little country they have. That our security depends on the nations outside of Israel, who because of the lack of spine of our latest leaders, have started to toy with us and attempt to veer us down a path to our own demise. We are not calling for revenge, we are demanding respect, we are demanding that our leaders act to keep our families safe. That they stop using us to play with the world. We are the strongest people in the world, we are ready to defend ourselves, our land, and our people, wherever they are. We are ready to continue to better the world. We demand that our government acts to keep Israel, all of Israel safe. No more talking the talk, time to walk the walk. Otherwise, exit…stage left.